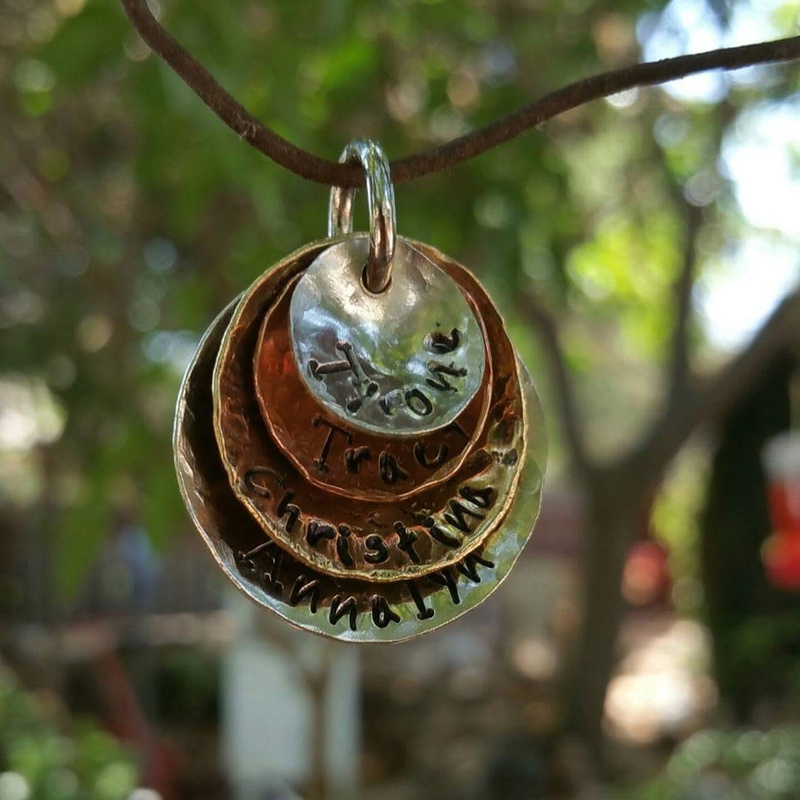 Personalized Disk Necklace ~ Great Christmas Gift! When I went to a local scrap yard sale I was lucky enough to find a whole box full of brass strips that were salvaged from a local trophy shop. They've been sitting in my garage for months and I've made a few pieces of jewelry with them but this necklace was the best! My customer wanted a stacked necklace with different colors/kinds of metal so there would be a contrast instead of the usual silver or copper which is the norm. I've used all recycled pieces for this pendant. The Silver is from an old Silver plated spoon that was worn thin and easily cut with my disk cutter while the copper is from a scrap piece from an A/C Company and the brass is originally from a Trophy Shop. I cut each piece, stamped them with names, hand hammered a texture on each one, domed then drilled each one before tumbling them to polish the surface and add strength to the metal. What do you think? Need one for yourself or a special Christmas present? Just send me a message and we'll talk! Thanks for this interesting information. I love reading and getting information from this blog. Article writing is a great art and we all try to have the best writing but not all the people are of the same quality in their writing. I see writing services are great to provide the best ideas we can get for our best writing. Wow, nice tips there, we are thinking about spending a week or so in Italy this year with my family. I think there are quite interesting ideas to keep in mind, thanks a lot for these, appreciate it. People often think that losing a weight is not a big deal. But believe me you have to struggle so hard to lose your weight. The rush my essay service even though gives quite a few tips regarding the weight lose. All you have to do is to try your best.